Sister Mary Natalie was a religious sister [i] with the Daughters of Our Lady of Compassion, known as Sisters of Compassion, a Catholic order of nuns founded in Jerusalem on the Wanganui river in 1892 by Suzanne Aubert, a French woman who came to New Zealand with a group of Marist missionaries in 1860. In Wellington the Sisters established a Home for people with incurable illness, a soup kitchen and a crèche. The Home of Compassion at Island Bay opened in 1907, later becoming the headquarters of the Sisters of Compassion, and the formation house where the Sisters did their religious training. Sister Mary Natalie was named Margaret Theresa by her parents Catherine (Kate) Theresa (nee KENNEDY) [ii] and Michael (Mick) MEARA (often spelt O’MEARA). Her father and mother were both from Ballymackey in County Tipperary, Ireland. Kate had emigrated with her parents and siblings in 1862, and Mick arrived 15 years later, in about 1877. They married in the Ahaura Catholic Church on 8 November 1881, and had 10 children between 1882 and 1897. 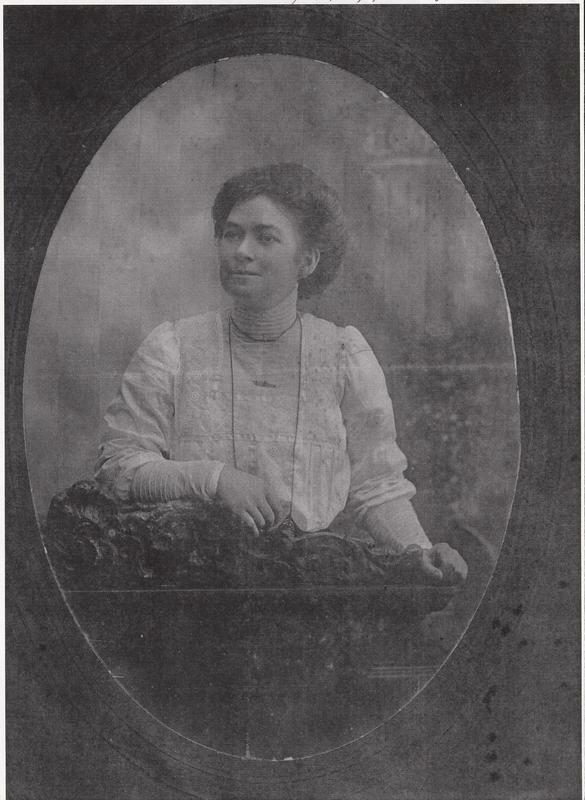 Margaret Theresa was their fourth child and oldest daughter, born on 15 November 1885, at Totara Flat, Reefton, on the West Coast of the South Island. The oldest – twins called John and Cornelius - died shortly after birth. ​Margaret lived at home on the farm with her parents until she entered the Order in Wellington on 27 July 1910. Two of her brothers, William James (Will) and John were by then resident in Wellington, both appearing on the Electoral Roll for Wellington North in 1911. Will was a clerk and lived in the Metropolitan Hotel, Molesworth Street, and his younger sibling, John, was a compositor and lived at 66 Hill Street. Will was apparently very athletic so features in sports reports in local papers from time to time. He worked for J. Staples and Co. (later part of New Zealand Breweries), whose brewery was a short distance away from his digs in Molesworth St [iii]. His grandfather’s first cousin, prominent Wellington businessman and politician Martin Kennedy, was the Managing Director [iv] of the company. Will was a clerk with this company when he enlisted for military service in 1916. John may have worked for the Government printer. 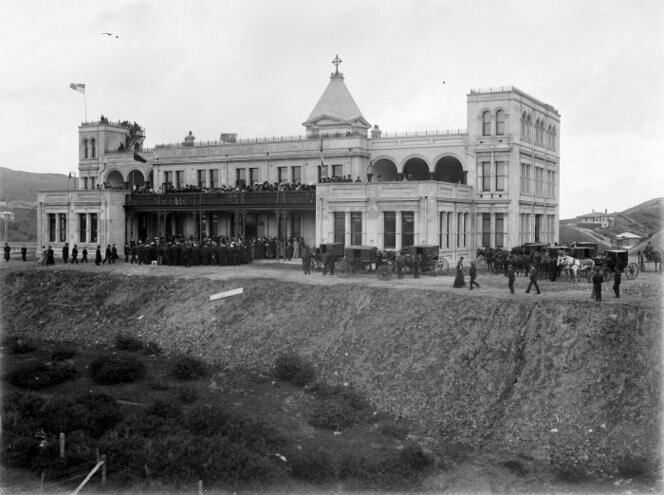 According to the archives of the Order, Margaret entered the Sisters of Compassion at Island Bay on 27 July 1910. “On entrance to the novitiate she received her religious name, Sister Mary Natalie. She was 25 years old.” She was professed on 2nd October 1913 [v]. Her younger sister, Mary Magdalen had, at the age of 19, entered religious life a few months previously, joining the Sisters of Mission in Christchurch in 1909. Will O’Meara signed up for military service in September 1916, and was promoted to Sergeant for a time. He made it to the UK, but had damaged a knee in a sporting accident in 1912, and was unable to march or spend time on his feet without his knee swelling and becoming too painful. He was repatriated to NZ in March 1918 and discharged on 15 April 1918. In 1917 Mick O’Meara was working the farm with Cornelius Patrick (Con), but Con was called up for military service in May 1918. His brother John had returned to the farm from Wellington by 1914, so he was able to take over, remaining on the farm in Totara Flat till he died in 1932. Con too never saw action. He arrived in England as the war was concluding then caught the measles and was eventually returned to New Zealand in October 1919. In 1917 another younger sister, Celia (also known as Cecilia, and known to her family as “Ceal”) also entered religious life, following her sister Mary into the Sisters of Mission order. On 6 November 1918, the Sisters of Compassion Leadership Team elected Sister Natalie to the role of Novice Mistress. The appointment was pro tem pending the General Chapter to be held when Mother Aubert, the founder of the Order, returned from Rome where she had been since 1913 to obtain the Decree of Praise which would ultimately give her order independence from the church in New Zealand. Mother Aubert was ultimately successful in her mission when Pope Benedict granted the Decree of Praise to the Daughters of Our Lady of Compassion, making it the only Catholic congregation born and growing to maturity in New Zealand, and the smallest congregation in the world ever to have attained this status. ​Sadly, Sister Natalie was never able to be confirmed in her new role, as she became ill on 3 December. According to the Home of Compassion records it was thought she might have caught it through visiting her brother Will who had it severely. Dr Mackin pronounced five days later Sister dangerously ill. She received Holy Viaticum at 11.30 p.m. on the night of the 12th - she had previously taken her Perpetual Vows and had been anointed. The Community were with her until she breathed her last at 20 minutes to one on the morning of 13 December 1918. Sister Mary Natalie was 33 when she died. Two funeral notices were inserted in the Evening Post on 13 December, one on behalf of her father and the other by E Morris jun. the funeral director. These advised there would be a Solemn Requiem Mass at 8.30am in the Private Chapel of the Home of Compassion at Island Bay, followed by departure for Karori Cemetery at 10.00am. 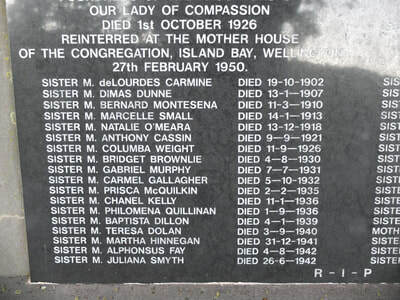 Sister Natalie was the fifth of the Sisters of Compassion to be buried in their multiple plot on the top of the hill in the first Roman Catholic section. The Sisters of Mercy and the Marist Brothers have large multiple plots immediately adjacent. Two of Sister Natalie’s siblings entered religious life and became sisters with the Sisters of Our Lady of the Missions, founded in Lyon France in 1861 and establishing the first New Zealand community in 1864 (by French missionaries of the Order) Mary Magdelan O’Meara (referred to above) became Sister Mary Augustine RNDM [vi], and Celia Frances O’Meara became Sister Mary Paul RNDM [vii] [viii]. 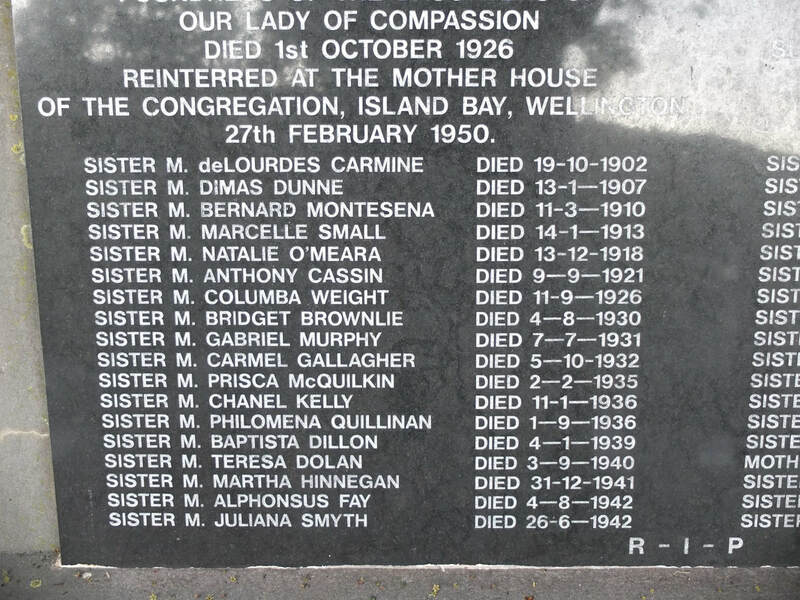 Sister Mary Augustine died in 1970 aged 80, and is also buried in Karori Cemetery, with other Sisters of Mission. 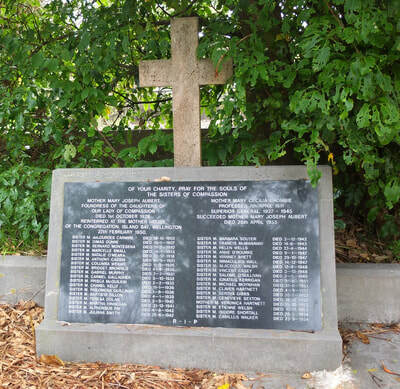 Sister Mary Paul died in 1976, aged 84, and is buried in Te Henui Cemetery, New Plymouth. 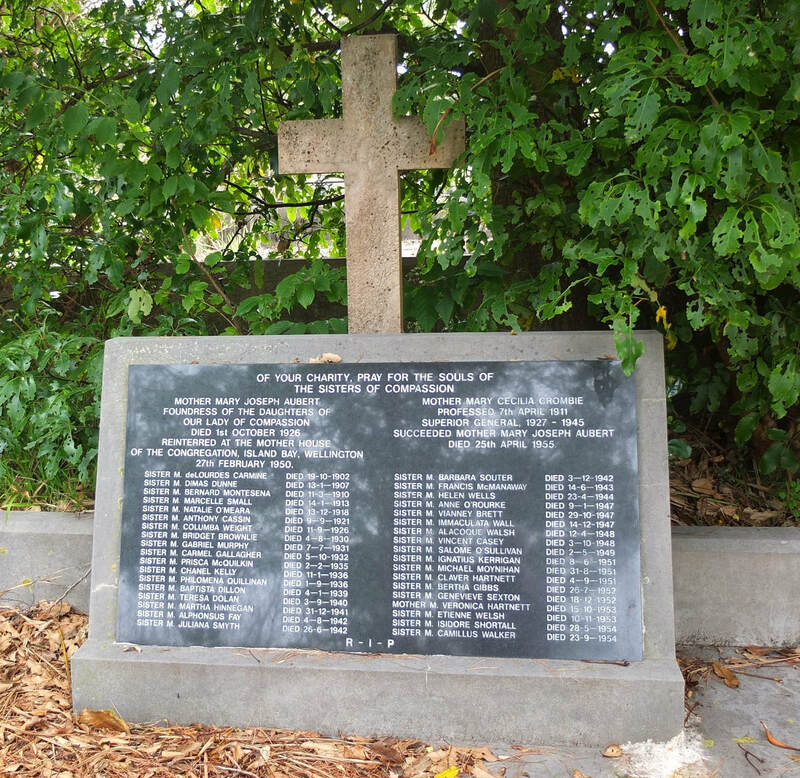 Mick O’Meara died in 1921 and was buried in Greymouth Cemetery, and his son John was buried with him in 1932. Their mother died in 1934, in Totara Flat. Researched by Penny Holden and Barbara Mulligan, with additional contributions from Sharron Cole (Sister Natalie’s great niece), and Sister Carmel Cole (Sisters of Mission). [i] In common usage the terms "nun" and "sister" are often used interchangeably (the same title of "Sister" for an individual member of both forms), they are considered different ways of life, with a "nun" being a religious woman who lives a contemplative and cloistered life of meditation and prayer for the salvation of others, while a "religious sister", in religious institutes like St. Mother Teresa's Missionaries of Charity, lives an active vocation of both prayer and service, often to the needy, ill, poor, and uneducated. [ii] Kate’s father was well known on the West Coast, as a shopkeeper in Hokitika and then a hotelier at Ahaura (less than 10 km from Totara Flat). His first cousin John was a prominent Merchant, mine owner, businessman, and Catholic layman. He was Managing Director of J. Staples & Co. brewery in Thorndon. 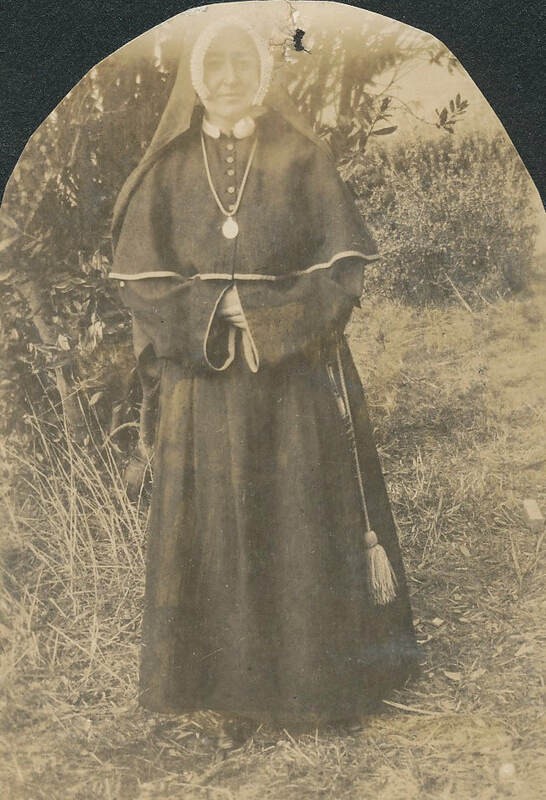 [vi] Sister Mary Augustine became a postulant at the age of 19, in 1909; became a novitiate in January 1910; took her first vows on 8 January 1912; and her final vows on 8 January 1918. [vii] Sister Mary Paul became a postulant on 12 May 1917; became a novitiate on 5 January 1918; took her first vows on 6 January 1920; and her final vows on 6 January 1926.